Landers Chrysler Dodge Jeep Ram of Norman, Oklahoma has a great selection of Ram Promasters available for sale! Built to handle heavy workloads, the all-new 2019 Ram Promaster is the ideal vehicle for those jobs that require reliable transportation every day. The newest version of the Ram Promaster sees a slew of exciting updates that make it the perfect van for most business types! With four unique and functional trims to choose from, it’s easy to find a 2019 Ram Promaster that fits into your lifestyle. Click here to view our available RAM Promaster inventory now! Performance: Outfitted with a Class-Executive front-wheel-drive system, the all-new Ram Promaster is one of the most capable RAMs ever made. A 3.6-liter Pentastar V6 engine with a six-speed automatic transmission arrives standard in the updated Promaster and has the ability to generate up to 280 horsepower and 260 lb-ft of torque for plenty of performance. And thanks to all of that power under the hood, the 2019 Ram Promaster has a max payload of 4,680 pounds and a max towing capacity of 5,100 pounds–talk about a heavy lifter! Design: Everything about the new 2019 Ram Promaster’s overall design was created with the driver in mind. For starters, the latest model of the Ram Promaster gets several updates to the exterior such as a new grille, optional black steel wheels, new bumpers, seven color options, and new side-panel options. This also includes an easily removable three-piece front fascia which makes it incredibly easy to repair the Promaster if necessary. Available as a cargo van, a window van, a chassis cab, and a cutaway van, it’s so easy to make the 2019 Ram Promaster exactly the vehicle you need. Once you step inside the updated Promaster, you’ll find 180-degree swivel seats and tons of legroom for ultimate comfort and functionality. Technology: The all-new 2019 Ram Promaster also comes fully loaded with some of the coolest (and most helpful!) automotive technology that is available on the market today. At the helm of the upgraded Promaster you’ll find a beautiful 5” touchscreen that houses the Uconnect 3 NAV system. Get directions, answer phone calls, listen to music and more–all directly and wirelessly through the new Ram Promaster. And the onboard ParkView Rear Back-Up Camera partnered with the ParkSense Rear Park Assist System makes backing up a total breeze. Is the RAM Promaster the perfect vehicle for all of your transport needs? 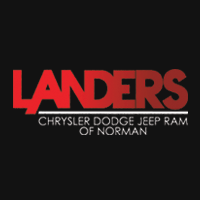 Click here to visit Landers Chrysler Dodge Jeep Ram of Norman today!